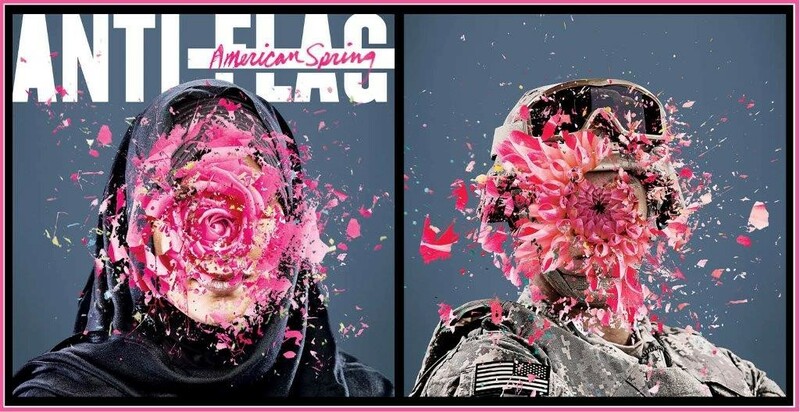 (New York, N.Y.): Historically, Pittsburgh-based punk stalwarts Anti-Flag have always had important, socially conscious messages to convey and musical statements they’ve been driven to make. That ethos remains intact with their new album, American Spring, which is their Spinefarm Records debut and is due out on May 26. The band has shared the front and back album artwork and it will certainly spark conversations among the youth and perhaps inspire change, in the spirit in which punk rock was initially founded. There are plenty of ways the viewer can interpret the vivid artwork, as the front cover features a woman wearing a black hajib veil, while the back cover features an American soldier in combat fatigues. Both of their faces are obscured by an exploding pink flower. On March 31, the first track off the album, “Fabled World,” will be premiered worldwide.